In winter in Toronto, poor road visibility can be deadly. This is why if you have even so much as a failed indicator light, local law enforcement can and will ticket you. This and occasionally insist that your vehicle is rendered immobile until a problem is resolved. Did you know, however, that driving with foggy headlights which cast dim, yellow, oxidized beams, can be just as dangerous as driving with no headlights at all? At Detailing Pro Shop in Toronto, we’re just as passionate about overall road safety as we are high-quality vehicle presentation. 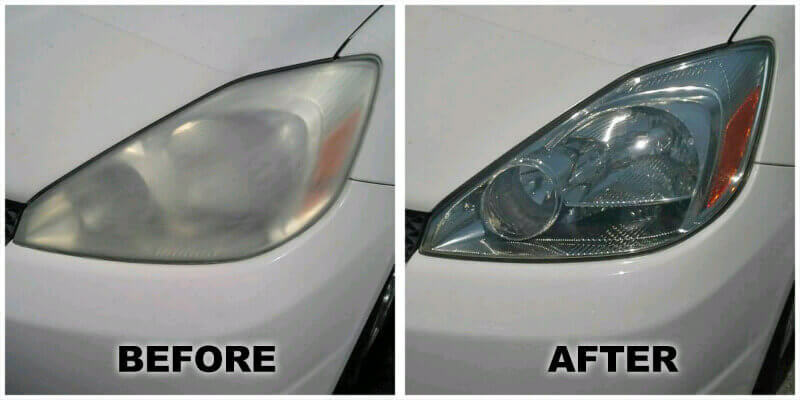 This is why we offer a professional headlight restoration service, designed to help you save money on replacing headlights, whilst still benefiting from better road safety & increase visibility. Car headlights become cloudy due to the fact that most headlight houses are made using polycarbonate plastic. This is plastic which is strong. The only problem is that as vehicles age, headlights gradually start to react with everyday pollution, UV radiation, and even many common car cleaning chemicals. Application of oxidation sealants to help protect car headlights for as far as possible into the foreseeable future. At Detailing Pro Shop, we save you money whilst also ensuring your continued road safety. This being the case, don’t wait to get your headlights in check. Instead, call or contact us now for further information.